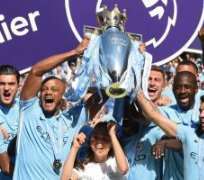 London (AFP) – Manchester City take on Chelsea in Sunday’s Community Shield — the traditional curtainraiser to the English season — but the Wembley showpiece will offer few clues as to the destination of the Premier League title. The glorified friendly between the league champions and the FA Cup winners has been a notoriously poor predictor of success in recent years — no winner has gone on to be crowned champions in the same season since Manchester United in 2010-11. The game, likely to be played in sizzling summer temperatures in London, is set to feature various youngsters and fringe players as World Cup stars ease their way back into club action. But whatever the line-ups, there are plenty of talking points and the game will be closely watched for clues as domestic football reclaims centre stage just three weeks after the World Cup final in Russia. Can Manchester City pick up where they left off last season or will they have a serious challenger? Will new manager Maurizio Sarri be able to revive FA Cup winners Chelsea, who finished fifth last season after winning the title the previous year under Antonio Conte? One question for City fans is how manager Pep Guardiola will deploy Riyad Mahrez — the only significant addition to their already-impressive list of forward options during the summer transfer window. The manager has confirmed his record £60 million ($78 million) signing is in contention to start the match after he was forced off during last weekend’s final match of the US pre-season tour against Bayern Munich. “Mahrez is good. He had a little bit of pain but he trained day before yesterday — I think so (he can play on Sunday),” said Guardiola, who twice outwitted Sarri in the Champions League last season when the Italian was managing Napoli. Most of the players who were on duty at the World Cup have now returned to training but Raheem Sterling and Kevin De Bruyne are still on their post-Russia breaks. The City manager also revealed how much he was looking forward to locking horns with Sarri, who replaced Conte last month. “I am happy that he is here in the Premier League,” Guardiola said. “I will learn a lot to see his team every weekend. I saw three games — he gets it, the team in a short time plays like he wants. Guardiola admitted the match comes at a tricky time without his full complement of players but said City were prepared and would target their fifth Community Shield win. Both sides have four victories apiece in the fixture. And France World Cup winners N’Golo Kante and Olivier Giroud, Belgium trio Eden Hazard, Thibaut Courtois and Michy Batshuayi, plus England’s Gary Cahill, are yet to return following the World Cup. Sarri suggested a similar side to the one that featured in pre-season would play at Wembley, meaning 17-year-old Callum Hudson-Odoi could be included. The 59-year-old is eager to do well but he acknowledges the size of the task against the Premier League champions. Sarri, who has not won a trophy in his career, said: “The match for us is very difficult for one reason: they have worked all together for two years. We started two and a half weeks ago. There has been speculation in the past few weeks over a number of Chelsea’s most high-profile players, with goalkeeper Courtois and midfielders Willian and Hazard all linked with moves away from Stamford Bridge. Sarri said he was confident that Brazil playmaker Willian would remain at the club but was less sure over the future of Courtois.